4 slices of bread - regular or gluten free depending on your diet. Turn on your oven grill. Lightly toast the bread. Meanwhile, tear the ham into pieces cut the salami in half and thinly slice the mushrooms and tomato. Lay the toast on a baking tray and spread evenly with tomato paste. Layer 2 slices of toast with ham and the other 2 slices with salami. Next top each slice of toast with tomato, spinach and mushrooms then sprinkle each slice of toast with mozzarella. 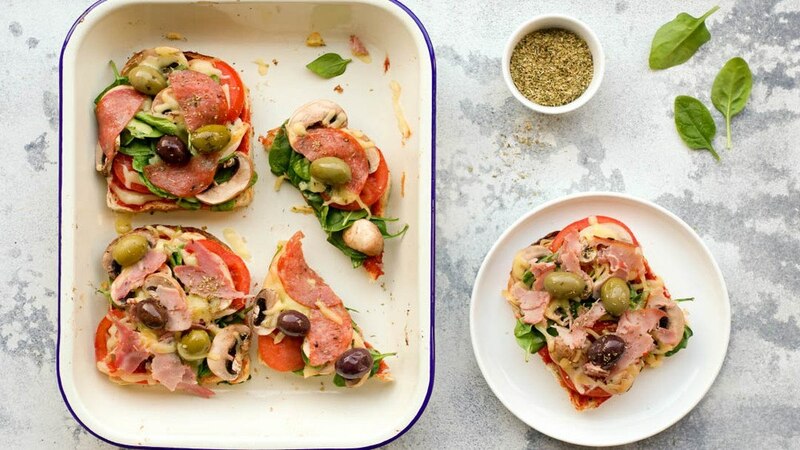 Finally top your toast with the remaining ham and salami (I like to alternate depending on what I’ve put on the bottom), drop your olives on top and sprinkle with oregano. Place the baking tray in the oven and grill for 5 minutes or until the cheese has melted.